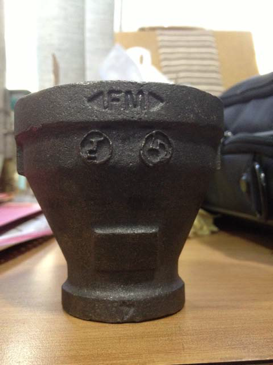 FM Approvals has been made aware of ductile iron castings of various pipe fittings bearing a counterfeit FM Approvals’ certification mark. FM Approvals has neither tested nor certified these products. Ductile iron castings illustrated below. The products bear the FM Approvals certification mark as cast into the product. The castings also bear the insignia of the casting company represented by the overlapping TC, representing Tough Casting. According to the manufacturer, approximately 300 castings were manufactured and shipped to one customer. That customer has been advised and Tough Casting has ceased this practice. Not FM Approved; never tested. Tough Casting Pvt. Ltd. is not an FM Approvals’ customer.  FM Approvals has never tested or certified their products nor have we conducted surveillance audits at their manufacturing facilities in order to support any claim of FM Approval. As such, the identified products shall not be considered suitable for use in any property loss prevention application. Figure 1. 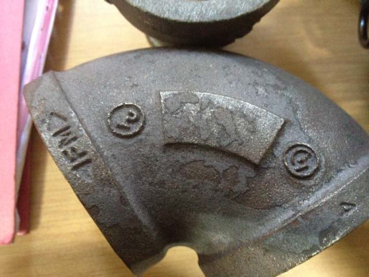 Example of the marking identifiers on the counterfeit castings. Figure 2. Second example of counterfeit casting. Note the same identifiers as Figure 1.